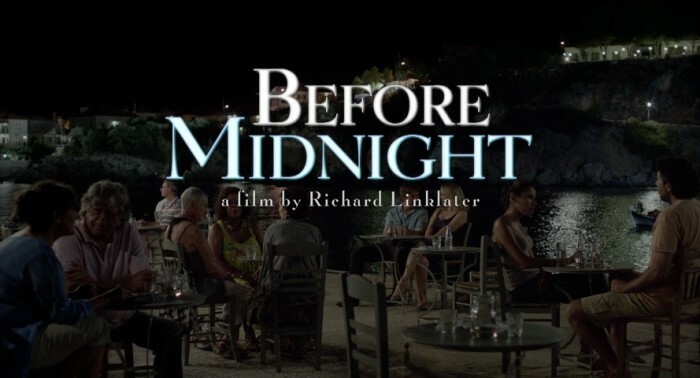 Opening tomorrow here in Australia, Before Midnight (2013) is the third entry in the Before… series of films from director Richard Linklater and stars Julie Delpy and Ethan Hawke. I have only recently watched (and loved) the first two films: Before Sunrise (1995) which is fantastic, and Before Sunset (2004) which is something of a minor modern classic in my view. As such, expectations were pretty high for this third entry. If you have not seen either of the first two films, they are essentially romance films, that on the surface should be too schmaltzy to handle. But somehow they work really well, the improvised dialogue and realistic feel coming through. However where the first two films are a couple falling in love and rediscovering each other, Before Midnight is two people having a stupid fight. Imagine if you met my fiancée and I for the first time, and we just had an absurd, meaningless argument that just jumps from point to point for an hour and a half. An argument where the parties involved lose all perspective of why the hell they were even arguing in the first place. How would you feel about us? That is what this film is like. The snappy dialogue and rapport between Hawke and Delpy that is channelled in such interesting directions in the first two films is just mired in the blandness of everyday life here. I respect the direction that the film is taken, but it is not what I go to the cinema for. I want the whimsical idealism of the love story between these two characters, Celine and Jesse. I was just not prepared for this very domestic drama. Before Midnight tries a fair few different things to the first two films. For starters, it introduces more outside characters, they are on a holiday with a number of other people when the film starts. It also has a bit more of a rambunctious, obvious sense of humour, which actually manages to merge pretty well with the vibe of the rest of the film. I’m not so sure that the external intrusions of the additional characters work so well though, they distract from what made the first two films so iconic, i.e. the singular focus on Delpy and Hawke. The additional characters help to make much of the film a comedy rather than a love story. Indeed, the film is part comedy and part relationship drama. None of the wondrous romance of the first two films. Overall, despite the two lead actors being once again fantastic in their roles, the film was too grounded in reality for my liking when I was just looking for a continuation of the grand love story. Before Midnight unfortunately takes these two really endearing, even if slightly pretentious characters and makes them just utterly unlikeable. This film has worked for a lot of people, but it did not work for me. I was not ready to accept ‘real life’ from the characters of Celine and Jesse. I want a love story for the ages, not a daft argument which makes me dislike them both. There is just not enough joy in this film for me. Like what you read? Then please like Not Now I’m Drinking a Beer and Watching a Movie on facebook here and follow me on twitter @beer_movie. Nice review mate. I was one of those people for which the film really worked. I liked how it felt like a proper continuation of their lives and not just more of the same in a different setting. I think it would have felt too samey if that were the case. I can definitely appreciate that it wouldn’t work for some though, it’s a totally different direction than the previous two. I’m still unsure on the ending though, it felt a little too abrupt for me. Yeah, I think I am definitely in the minority on this one. And I agree with you that it did feel like a ‘real’ interpretation of where they would be. I just felt that it went on too long with the argument in the hotel room just spiraling on and on. You nailed it on the ending too. It didn’t work at all for me. Having said that, the ending to Before Sunset was quite similar but that one worked incredibly well. So perhaps they were trying to pull off something a little similar. Even though this did not work for me, I really hope they revisit the whole thing in another 9 or 10 years time. This series seems to either grab you or leave a bad taste in your mouth. Have you seen any of them Cindy? Most people seem to have loved this third one. But whilst I loved the first two, this just didn’t do it for me. I saw the first and liked it alot. The second one is hazy to me–maybe I was half asleep when I viewed it. The third — no. I’ve put it on the back burner. Nice review. Sorry it didn’t work you. I absolutely loved Before Sunrise, but I’ve yet to see the other 2. You should definitely check the other two out Fernando. Whilst I didn’t love this one, plenty of people did. And as for Before Sunset, it is my favourite of the bunch. This movie absolutely destroyed me, and I mean that in a good way. Nice review. Thanks very much for commenting.